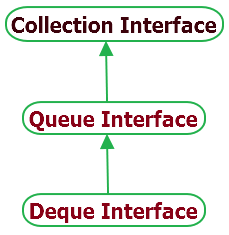 Deque is one of the collection interface which extends Queue interface. Deque is linear collection which allow us to add and remove element from both ends of the queue. It is "double ended queue" that's why it is called Deque and usually pronounced as "deck". Deque has different methods to perform insert, delete and examine the element in queue. Each of these methods have two different forms. One will throw an exception if it fails during operation and other will return a special value like null or false. Different methods of Deque interface are described below. boolean add(E e) : It will insert specified element at the tail of this deque if space is currently available. Return true if operation is success or throw an IllegalStateException if fails to perform operation. void addFirst(E e) : It will insert specified element at the beginning of the queue. void addLast(E e) : It will insert specified element at the end of the queue. boolean contains(Object o) : It will return true if specified element is available in queue. E element() : It will retrieve head(first) element from queue. E getFirst() : It will retrieve first element from queue. E getLast() : It will retrieve last element from queue. boolean offer(E e) : It will insert specified element at the tail of this deque. It will return true if success and false if operation fails. boolean offerFirst(E e) : It will insert specified element at the beginning of queue if space is available. boolean offerLast(E e) : It will insert specified element at the end of queue if space is available. E peek() : It will retrieve head(first) element from queue. Returns null if queue is empty. E peekFirst() : It will retrieve first element from queue. Returns null if queue is empty. E peekLast() : It will retrieve last element from queue. Returns null if queue is empty. E poll() : It will remove head(first) element from queue. Returns null if queue is empty. E pollFirst() : It will remove first element from queue. Returns null if queue is empty. E pollLast() : It will remove last element from queue. Returns null if queue is empty. E pop() : It will pops the element from queue. void push(E e) : It will pushes the element onto queue. It will return true on success and throe an exception if operation fails. E remove() : It will remove first element from queue. boolean remove(Object o) : It will remove first occurrence of the given element from queue. E removeFirst() : It will remove first element from queue. boolean removeFirstOccurrence(Object o) : It will remove first occurrence of the given element from queue. E removeLast() : It will remove last element from queue. boolean removeLastOccurrence(Object o) : It will remove last occurrence of the given element from queue. int size() : It will return size of queue. I have prepared example of ArrayDeque to explore you how different methods of Deque works. Also you can create LinkedList() using Deque. //Add element at first of Deque. //Add element at last of Deque. //Get first element from Deque. //Get last element from Deque. //Get first element from Deque using peek. //Get last element from Deque using peekLast. //Remove first element from deque. //Remove LastOccurrence of element from deque using removeLastOccurrence.